for anyone to explore the night sky. observatory; you can pan and zoom the display just like a telescope. KStars is a part of the KDE Edutainment Project. The entire virtual universe looks amazing! Kongrats Jason, this is really a big and hard work! I must add a congratulations too. I was impressed when I saw the first versions of this a while back. It's something I always wanted to see in KDE, but never had the time to help with. 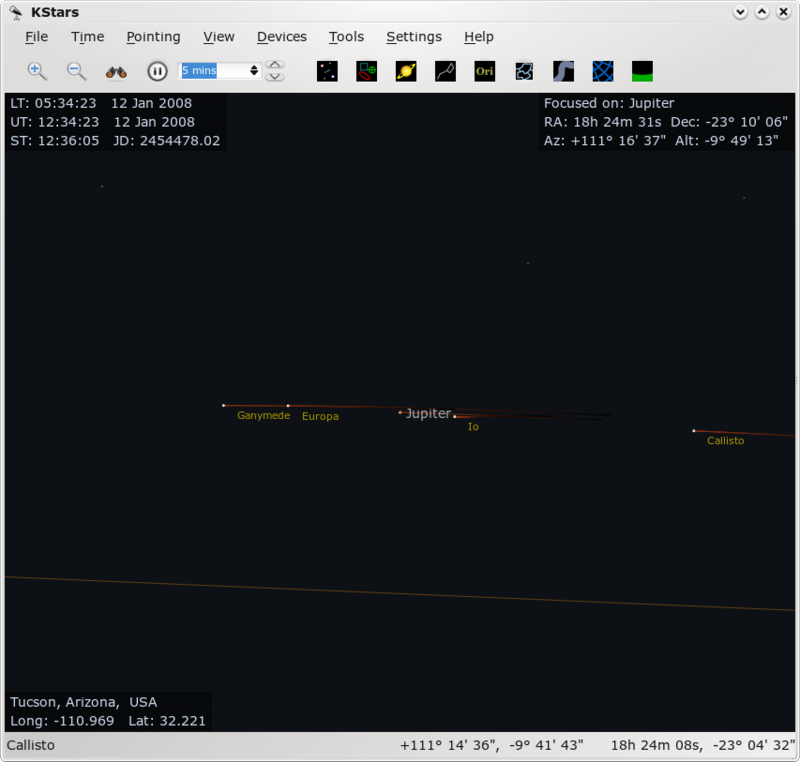 I'm lost without my star guide from my old Palm Pilot, but this is far more impressive. 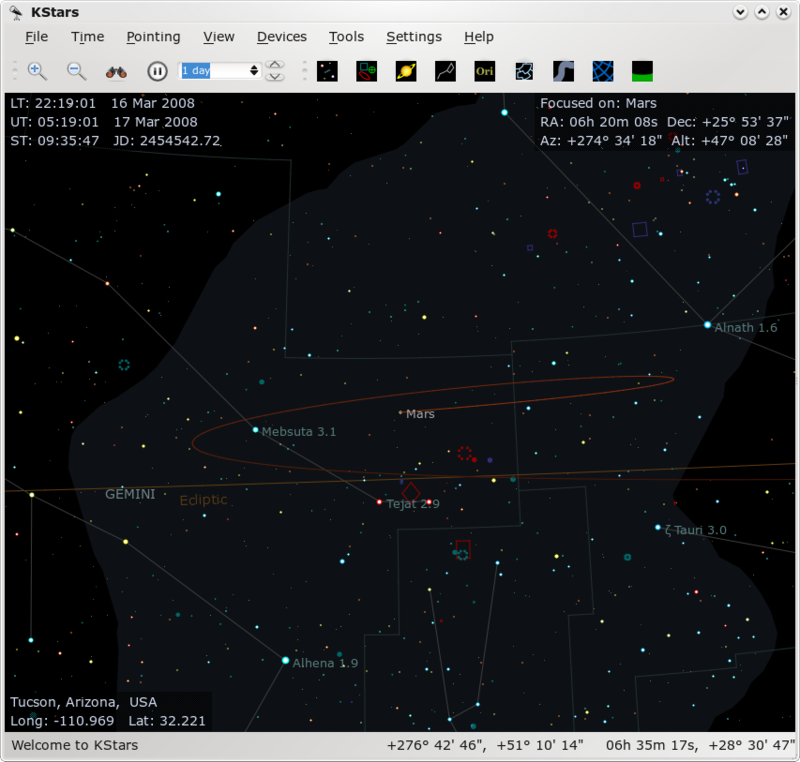 For those interested in astronomy, either as a hobbyist or a professional, KDE is a great platform to start porting the old astronomy apps and writing new ones. It would be great to see some IRAF enhancements in KDE, such as a kgterm, kimtool, etc. Also an IRAF cl syntax highlighter for Kate. Bug with Kstars and Gnome desktop? There is a bug that happens on my Red Hat Linux 9 and KStars under Gnome. I don't know which program's fault is, but I know that it happens only when KStars (latest version) is loaded on my 1600x1200@24bit@75Hz Gnome desktop, with the "nv" 2D driver. So, the problem is that when KStars is loaded (not maximized), all the other apps are really slow! Even typing on a text editor is slow! It just slows down everything, until I minimize or close down Kstars! Any ideas from the authors? Thx. 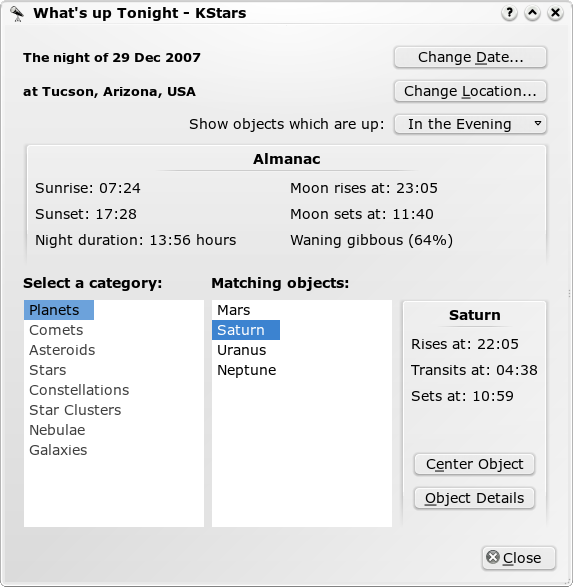 Re: Bug with Kstars and Gnome desktop? I think KStars uses OpenGL. If you're using the 2D driver, then that rendering is being done in software by mesa. It's probably grabbing all the cpu time it can get, which is why the other apps will be slow. Try running some other OpenGL programs and see if you get the same problem. You could use NVidia's supplied drivers which perform very well for 3D, unless you're a "free software only" type of person, in which case you'll just have to live with it. Them's the breaks. We don't use OpenGL yet, so that can't be the issue. I used to have a problem where my X server would eat all of the CPU when KStars was opened, which sounds similar to what you are seeing. Try running 'top' while kstars is running, see if it's X that is using the CPU. You might try upgrading to this new version. Send me an email (kstars AT 30doradus DOT org) or open a bug if the upgrade doesn't work. Sounds like you don't have the Xv extension loaded in your X server. This is a common error and is in the README file. An rpm for Mdk 9.1 is available in the contrib folder of Mandrake mirrors. Celestia is awesome. It's definitely been an inspiration for KStars. 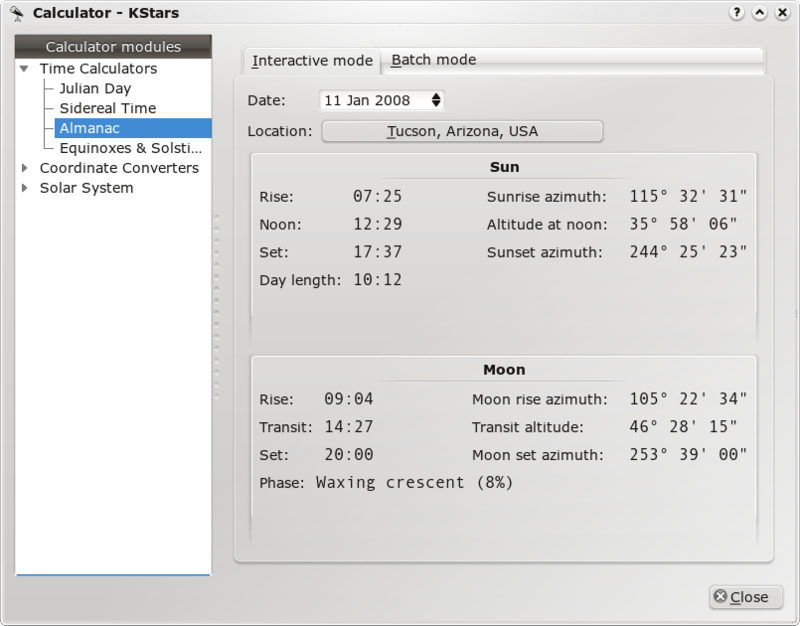 Actually the star info in the RMB popup menu in Celestia is directly inspired from KStars, so thank you too! I was thinking of having some integration with KStars too, like a [Point this object in KStars] entry in the popup menu. Does KStars has a DCOP interface? > Does KStars has a DCOP interface? No, not yet but we already have a script language so it should be easy to add. 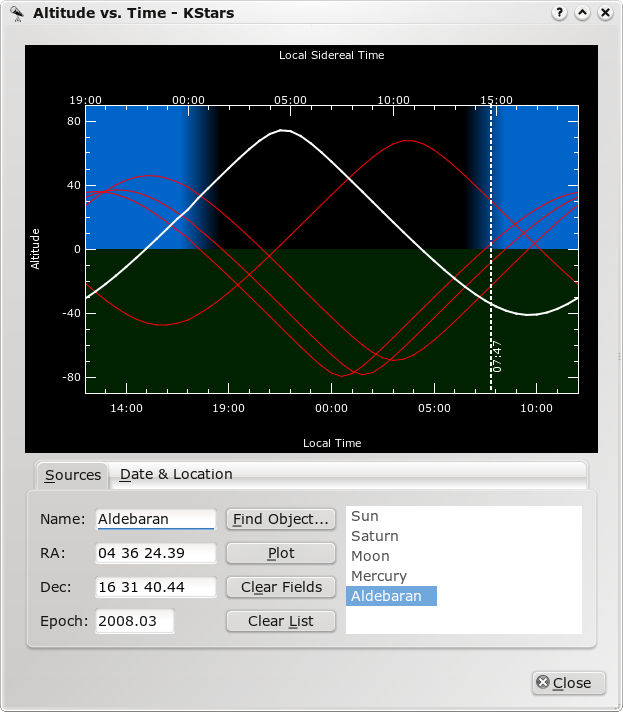 I was actually using this program to help me figure things out while using the Keck telescope in Hawaii a couple of weeks ago. Unfortunately one feature that I would really like (perhaps its there but I couldn't find it) is the ability easily add new objects. I know that its possible to load them from a text file - but I couldn't figure out the format that was needed and it would be really nice to have a dialog box for doing a quick-and-dirty addition of a new object. TYPE : RA : DEC : MAG : "Name of Object"
BTW - another quick question: Can I assume by the feature above that you don't use proper motions when calculating star positions? What kind of accuracy can one expect from kstars: minutes? seconds? We don't yet use proper motions. We correct for precession/nutation/aberration/atmospheric refraction. Minutes?! That's harsh, man :) The positions of stars are as good as the SAO, modulo the lack of proper motions, which is only going to matter for a handful of stars, and only for dates far from the present day. Hehe - sorry about that! Congrats on the Hubble Fellowship BTW. ... because it's one of my favorite things to show people, really a slick piece of software. 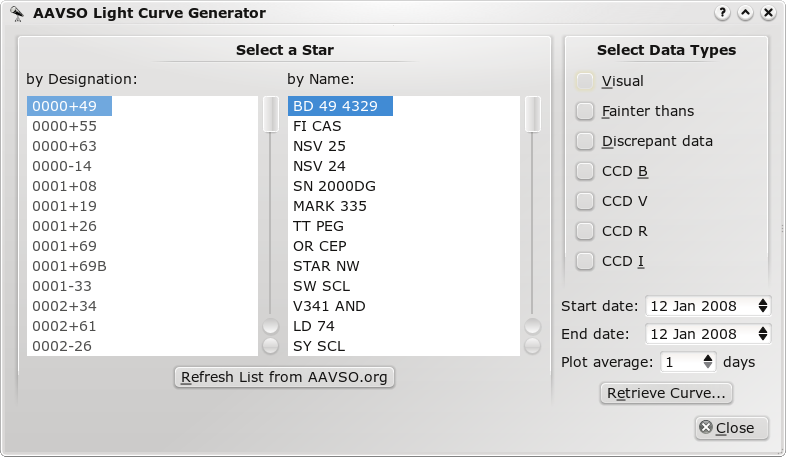 My astronomy is about as strong as my astrology (;)), so I do little besides enter a location and look at all the pretty dots, but the location db is very complete, it's great to see that even many smallish U.S. cities are listed. What a wonderful tool for people... well done, Jason. I know that you worked hard on this. Hope lots of people will use it.